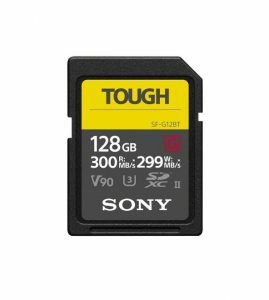 (SINGAPORE, 28 August 2018) – Sony today announced a brand new innovation in storage media with the launch of the “SF-G series TOUGH specification” UHS-II SD card. Addressing the needs of photographers who are reliant upon their photographs remaining safe when their SD cards are removed from the camera, the new SF-G series TOUGH specification range combines the world’s fastest read and write speeds with an ultra-rugged design that is bend proof to 180N and drop proof to 5 metres. For photographers who are fighting against the elements to get the perfect shot, the SF-G series TOUGH specification range of SD cards are also waterproof with an IPX8 rating and dustproof with an IP6X rating. The new SF-G series TOUGH specification range of SD cards are 18 times stronger than the SD standard[ix] with world’s first monolithic structure (one-piece molding, no empty space in the card) and materials of high-grade hardness, unlike conventional SD cards with a thin, 3-part ensemble. They are protected against typical physical damage that can affect conventional SD cards such as a broken plastic casing, broken data protection lock and broken connector ribs. This has been achieved through a new means that it is the world’s first rib-less SD card with no write protection switch. These developments ensure that the SF-G series TOUGH specification is more resistant to bending and easy to break parts are removed entirely and has been engineered by Sony to deliver the best balance of hardness and toughness. Completely sealed with one-piece molding structure, no waterdrop, dust or dirt is not allowed into the card, meeting the highest grade of waterproof (IPX8) and dustproof (IP6X) ratings. In an industry trend, driven by Sony, full-frame mirrorless cameras such as the α9 and α7 series are packing in more and more performance for both stills and video performance. These high-end cameras rely on fast memory cards to maximise their performance and with professional photographers now using SD cards more frequently, users are demanding the levels of reliability and durability associated with other professional card types. With the world’s fastest write speed of up to 299MB/s, buffer clearing time is minimised, also allowing the photographer to shoot many frames per second and capture the action that they want. The SF-G series TOUGH specification range also supports V90, the highest standard of video speed class, making it an ideal companion for shooting high resolution video. SF-G series TOUGH specification SD cards offer a series of further features, designed to give photographers peace of mind. These include an ‘SD Scan Utility’ which allows the user to check that the card is good condition and File Rescue Software[x] which can recover data and photos that might have accidentally been deleted. Furthermore, SF-G series TOUGH specification SD cards are also X-ray proof, magnet proof, anti-static, temperature proof and feature UV Guard. [i] As a consumer SD card, Sony investigation as of August 2018. [v] As a SD card of 2.1mm thick. Conformance to ribless card specifications of Standard Size SD Card Mechanical Addendum 6.0. Sony investigation as of August 2018. [vi] As of August 2018, Sony investigation. [vii] Based on Sony internal testing. Transfer speeds vary, and are dependent on host devices, the OS version or usage conditions. To effectively utilize the product’s high-speed capabilities, your compatible device must support UHS-II. Sony investigation as of August 2018. [viii] Conformance to IP68 standard. We cannot guarantee against damage to record data or card in all situations and conditions. [ix] SD standard withstands 10N force, while this card withstands 180N force.